"With their unique combination of flavonoids and sulfur-containing nutrients, allium vegetables—such as garlic—belong in your diet on a regular basis. There's research evidence for including at least one serving of an allium vegetable—such as garlic—in your meal plan every day. If you're choosing garlic as your allium family vegetable, try to include at least 1/2 clove in your individual food portion. If you're preparing a recipe, we recommend at least 1-2 cloves. Garlic is a wonderful seasoning to add aroma, taste, and added nutrition to your dishes. We often recommend using raw chopped or pressed garlic in many of our dishes to take advantage of the benefits derived from garlic. 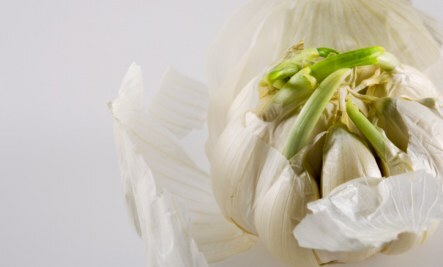 However, if you cannot tolerate raw garlic, you can add chopped garlic to foods while they are cooking. It is best to add it towards the end of the cooking process to retain the maximum amount of flavor and nutrition." Garlic owes its smell to a sulfur compound. The fact that it stinks isn’t unique– sulfur compounds are renowned for their nasty odors. In fact, sulfur compounds in intestinal gas are responsible for the smell of flatulence. Those sulfur compounds are pretty potent stuff, considering that they make up just one percent of the total intestinal gas released! 2. Garlic is an Healthy Aphrodisiac! Tibetan monks were forbidden from entering the monasteries if they had eaten garlic. It stirs up passions due to it’s ability to increase the circulation. Traditional Chinese medicine have used garlic for more than 3,000 years. Current research is trying to determine the role it could play in treating many health problems such as heart disease and stroke to possibly helping to prevent cancer and increasing your immune system. The allicin in garlic is also a powerful anti-biolic , which fights infection and bacteria. British researchers gave 146 people either a placebo or a garlic extract for 12 weeks; the garlic takers were two-thirds less likely to catch a cold. Other studies suggest that garlic lovers who chow more than six cloves a week have a 30% lower rate of colorectal cancer and a 50% lower rate of stomach cancer.Garlic helps to open clogged sinuses. Once upon a time it was used as currency. In the days of the pharaohs, ancient Egyptians considered garlic so valuable that they placed it in tombs, including in King Tut’s. Ancient Greeks gave it to Olympian athletes for strength and stamina. In India, 5,000-year-old Sanskrit records describe its curative properties. Why you should let Garlic sit for 5 – 10 minutes? To get most health benefits from Garlic, let it sit for a minimum of 5 minutes, after cutting and before eating or cooking. Waiting 5 – 10 minutes allows the health-promoting allicin to form. If you do not let it sit, allicin is never formed, so it is worth the wait. What is Allicin? I was having dinner with some friends one evening. My friend, Catherine had made a stir fry with lots of garlic in it; she told me that she could only eat organic garlic as when she ate non-organic garlic she would have extreme digestive problems. The zucchini for some is just an excuse for all the garlic but in any case, it’s a heavenly combination. Sauté zucchini and garlic in almond oil till soft for 5 minutes. Lentil Stew This savory soup has all the benefits of the mighty powerfood lentils plus much more. Chinese Vegetables The Real Food For Life version of a classic dish. Onion Gravy Everyone needs a great tasting healthy gravy like this.